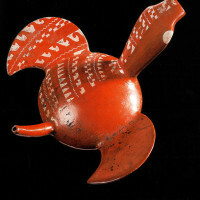 Sotheby’s finished up their Barbier-Mueller sale of pre-Columbian antiquities and it went, roughly, as expected. Subtle, Guillaume. Subtle. Wink wink. By my count Peru, Mexico, Guatemala, Ecuador, and Venezuela all provided the “context” that Monsieur Cerutti refers to (and maybe Colombia too? I am forget-y and without coffee. A situation to fix). Suffice to say I am now, right this moment, working on something terribly numbers-y and another something very academic about this auction. Details forthcoming. See I knew that masters in Pre-Conquest American antiquities auctions would be good for something. That doesn’t tell me why that weird bird pot thing sold for €1,609,500. I am not seeing it.